"A poorly made saddle often causes bad injuries to the Horse ; it is thus necessary that the Rider knows how it is made, in order to have it built in such a way that it does not cause any accident ; and to know how to fix those which happen sometimes, no matter how cautious one has been. The knowledge of the different styles of saddles and their purpose is also necessary." When a rider has a behavior or a training problem, a succession of bad performances, she rarely thinks of the saddle. She’d rather think she has a bad horse, a bit that is not strong enough, or a coach who is not good enough. However she does not know, or think, that all those issues can be caused by an ill-fitting saddle. A horse that bucks when cantering can buck because his loins are crushed by the saddle. The buck is then a way of saying “ouch! It hurts!” It is not, in that case, a submission issue, or maybe we consider that the horse’s submission has to be so complete he has to suffer in silence. A horse that does not stay on the bit and hollows his back when bending might do so because the gullet of the saddle is so narrow that the spine cannot correctly bend. It is not a real training issue, but maybe we prefer to force the bend and the attitude and risk back soreness. If we don’t think of the way the saddle fits the horse, we can as La Guérinière writes come to an end where the saddle causes severe injuries to the back. And I don’t think we want the horse to suffer to that point. I don’t think a horse should suffer at all. 1. Why is saddle fitting important? The saddle is the main communication interface between the rider and her horse. The rider can have the best hands in the world, the most sensitive seat, the most tactful legs, if the saddle does not allow her to communicate clearly with the horse, she will never reach the aim of dressage. Well, it depends on what is our aim, but I think it is to reach the level where the indications are so slight the rider seems to be doing nothing and the horse just dances with her. I guess I am not the only one to like dressage that way. 2. If the saddle doesn’t have a good balance on the horse’s back, how can the rider be properly balanced? But the saddle also has to fit the rider. How can one ride properly in a too small, too deep or too wide saddle? I’ll get back to it in a second article. Let’s focus on the horse’s issue for the moment. Saddle fitting is only a matter of good sense and logic. It is basic geometry, with a pinch of horse sense and a sprinkling of biomechanics knowledge. 2. Where to put the saddle, and which impact on the back’s structures? First of all, it is important to know how the back of the horse is made, and how the saddle interacts with it. The saddle rests on the ribcage and on the back muscles. Rule number one, that is never to be broken: the saddle must not touch the spine. The spine is a very complex and sensitive structure, made of bones, nerves and ligaments, which becomes easily sore. The lateral bending and longitudinal flexion of the thoracic vertebrae exist (even if the lateral bending is minimal). So the saddle has to leave room for those movements : this is why there is a gullet on every saddle. The width and the depth of it depends on the conformation of the back. On a bony, narrow back, it needs to be quite deep ; on a wide and flat back, it needs to be wider and flatter. In my opinion, it must be at least 4 fingers wide (between 8 and 10 cm). At the front of the saddle, two parts need to be cleared. First, the withers. Everyone knows how easy it is to have saddle sores on this spot and how long it is to heal (actually, not only saddle sores, but also rugs or saddle pads sores!). 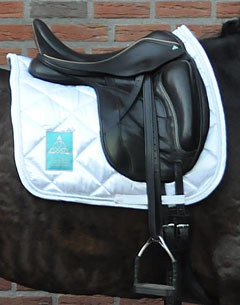 The saddle must provide enough room around the withers, so that you can easily slip 3 fingers on top of it (5 to 6 cm) and 2 fingers besides it when the rider is on. Less than 3 fingers on the top: the saddle is probably too wide and tipping forward; more than 3 fingers, the saddle is very likely to be too narrow, and looks as if it is perched on the back, instead of molding to it. As for the gullet, those are to be moderated: on a very low withers, you can slip sometimes 4 or 5 fingers and the fit will still be OK. What we do not want is the saddle resting on top of the withers, or the tree points pinching the trapezius. Rule number two: the shoulder blade. When the horse lifts a foreleg, the shoulder blade has a back rotating movement. If the saddle is too far forward or ill-fitted, it blocks the movement of the shoulder blade, which will cause restricted gates and poor balance. To place the saddle correctly, count about 2 to 3 fingers after the top of the scapula (shoulder blade), depending on how the scapula moves and how the shoulder is built (diagonal or straight). On some horses, it goes very far. It is sometimes necessary to have the panel adjusted to allow the top of the scapula to move freely. At the back of the saddle, the rider must be careful about the loins and the lumbar vertebrae. First of all, the saddle must not be too long. It cannot go behind the last rib. The shape of the back of the panels must mold the shape of the back : you do not use the same shape of panel on a flat back or on a croup high horse. I have heard the strangest things about how dressage saddles interact with the horse, one being that it pinched and restricted the shoulder movement. Actually, it is quite the opposite : the dressage saddle, with its long vertical flaps, is designed to free the shoulder movement! Those vertical flaps thus have straighter and longer front panels, which is maybe the explanation to that weird belief. The core of the saddle is the tree. Its aim is to spread the pressures on the back and to clear the spine. It can be traditional (made of laminated wood reinforced with steel) or modern (made of plastic, carbon, Kevlar…). In either case, it has to fit the horse in 2 ways : the gullet plate width, and the general shape ; for a traditional tree, you can add a third setting : the angle of the bars. On a swayback horse, you do not use the same tree that you would use on a flat back one : the swayback needs a more bent tree, the flat back a flat one. The bars are also flatter on a wide back, steeper on a “roof-top” back. It is tempting to use a soft, flexible tree, in order to have a saddle that follows every movement of the horse. Careful with that! If too flexible, the tree creates a rubbing effect, and the horse doesn’t like it. The resistance, the elasticity of the tree depends on the rider (we’ll come back to that later). Being the core of the saddle, if the tree is not quite right for the back, you can change your saddle. It is often more expensive to change the tree than to buy a new saddle. If you have a saddle on which the tree can be adjusted, you’re a tad luckier. Plastic trees can be thermoformed or altered with a vice if they’re made in a material that allows it. For more details on those, check directly with the manufacturers. You can also change the gullet plate, which is a very convenient device, especially for young horses whose shape changes all the time (I emphasize this particular point : the growth of a horse is not complete before its 7th year). Please be aware, though, that the changeable gullet plate or the adjustable tree is not everything. It helps to adjust the saddle, yes, but it would be far too simple if the fit was only controlled by this setting. It simply changes the head of the saddle, somehow alters the balance, but it doesn’t change the shape of the whole saddle! The panels are the second most important setting. Contrary to the tree, you can change them quite easily. Well, you can’t, but your saddler can. They’re made to lift the tree from the spine and give a shock absorber effect to the saddle (which is why the systematic adjunction of a pad amazes me, but let’s come back to this later). They’re made of foam, wool or air. Wool is the traditional flocking. It is supple and adjusts almost by itself to the small bumps and hollows on the back, but it needs to have a good aftercare, since it alters quite quickly. It is a very good material, especially when it is natural, because it is breathable and absorbs heat and moisture. Foam lasts longer than wool, but it is firmer and doesn’t mold to the back the way wool does, and is not breathable at all. Memory foam molds a bit better, though, but gets really hard in winter. Altering a foam panel is more complicated than altering a wool panel, which is why foam panels are mostly recommended for horses that have an almost definitive shape, which condition is closely looked after (controlled food) and which are exercised on a regular basis. Air is interesting in a shock absorbing way, and some horses and riders are really happy with it. On the Cair system, you cannot adjust it, but with the Flair system, there is a pump that controls the pressure. Many people share this feeling about air-filled panels : it is like sitting on a balloon and the sensations coming from the horse through the saddle are diffuse. Then come the girth and the girth straps. The shape of the girth, the position of the straps are determined by the horse’s conformation. The girth groove can be wide or tiny, more or less close to the forelegs, more or less shaped. It also depends on the angle of the shoulder, vertical or oblique, and the shape of the ribcage, more or less round. If the shoulder is very oblique, the girth groove tiny and forward, the belly round: you’re in trouble. The straps’ positions are numerous. You have straight straps or Y straps, point straps or center straps. They can be used to balance the saddle on the back. If the horse has an oblique shoulder for example, better use point straps to keep the saddle behind the scapula. Long or short girth: it depends on the design of the saddle and the length of the straps. In dressage, long straps are popular because they avoid the rider to have the buckles under her thighs, and thus allow a closer contact to the horse. If the saddle does not have monoflaps, it is possible to add an extra strap that tightens the upper flap against the sweat flap. Last but not least, the different pads. The choice of the pad is very important. A saddle used with a thin cotton saddle cloth has a totally different fit when used with a sheepskin half pad on top of a thick and comfy-looking pad. Quite often, people tend to think that the more layers they put between the saddle and the back, the more comfortable the saddle will be for the horse. By the same token, you would make a new and stiff pair of shoes more comfortable with thick woolen socks. And yet, we all know that this is wrong : the pair of shoes will only be tighter and will cause blisters and even back pain, after a while. Well, same goes for saddle and pads. What make a saddle comfortable is its fit. If it fits perfectly on the bare back, placing several layers between the back and it will only make it too tight. One has to be very careful when choosing and using the pad(s). If the fit of the saddle is correct, if the panels are made carefully and with good quality materials, there is no need to use an extra half pad, or a thick saddle cloth. It always makes me smile when I hear people looking for close-contact, monoflap saddles, and then adding loads of thick layers between it and the horse. What is the aim of all that?! If the shape of the back is special, a corrective pad can be used. For example, on a horse that has very asymmetric shoulders, you can use a corrective pad with extra shims on the weakest side in order to balance the saddle and the rider. When, out of exercise, the symmetry is restored, the shims can be removed. Sometimes the rider uses a shock absorbing pad, not for the back of the horse but for her own comfort. I don’t understand this: why wouldn’t she use a seat saver instead of taking the risk of altering the fit for the horse? Be careful of the shape of the saddle cloth. Choose one that has a good withers clearance, not one that is straight cut along the vertebrae. Be also careful about the length of the pad : it has to be longer than the saddle. If it is a bit short, then the saddle sits on the bindings, which is very uncomfortable for the horse. And do not trust fashion. Saddles, girths, saddle pads : they all exist with a purpose, and answer to a specific problem. Do not use something because you’ve seen it at a show, and you thought it was fancy. Before doing so, please take some advices. Special thanks to Glenn M. Hasker, SMS saddle maker and saddle fitter; and to Nikki Newcombe, from Bliss Saddlery LTD.